Are you landing in your zone of thriving most days? Home/Passion and Purpose/Are you landing in your zone of thriving most days? It’s a tricky thing talking about self-care to mothers. Something happens when we cross over the motherhood threshold that radically changes the terrain of our lives. We enter a life of self-sacrifice like we have never known before. Our lives are now tethered to another in a way that requires a level of self-sacrifice that most of us happily, willingly and completely sign up for. As my children’s mother, I want to sacrifice for them. But sacrifice has become a confusing issue for modern mothers. On one hand we are culturally (and I believe genetically) designed to fully and whole-heartedly accept the walk of sacrifice in order to reap the tremendous benefits and joys of motherhood (not to mention the tremendous benefits of self growth). On the other hand, we are chastised not to lose ourselves in the name of our mothering identity. To reclaim a strong sense of our own self and personhood and prioritize our own self care as non-negotiable. It’s a farce that self-sacrifice and self-care are pitted against one another. We must learn to hold both of them at the same time in order to shift into our zone of thriving. 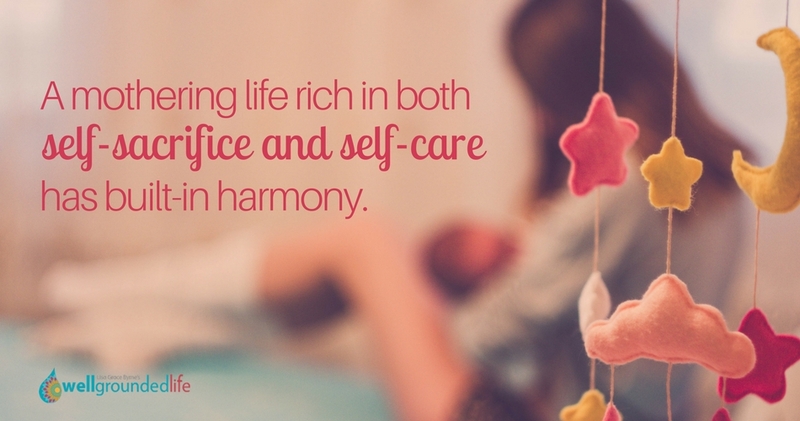 A mothering life rich in both self-sacrifice and self-care has built in harmony. They are natural checks and balances for each other. It is when one becomes dominant to the other that things get radically off kilter. When you’ve experienced an imbalance of far too much self-sacrifice with very little self-care, you aren’t self-sacrificing any longer you are now firmly in the zone of self-neglect. And if you find yourself less sacrificial, less generous and less able to give deeply to the people in your life that matter the most to you, you aren’t experiencing self-care, you have now slipped into self-absorption. Unfortunately, many mothers find themselves toggling back and forth between self-neglect and self-absorption…never knowing how to find that sweet spot that honors both the deeply generous and sacrificial life we want to have for our family and the deeply self-connected and nurtured life we want to extend to ourselves. A vibrant mother’s balance is in the zone of both self sacrifice and self-care. And more specifically, in a place where one reinforces and enhances the other. When self care is non- negotiable, restorative and prioritized in a mom’s life, she has the very best of herself to offer her family. And as she offers her very best to her family, herself and the world…she models to her children how part of living with your well being intact is caring for yourself as you care for others. So where on the scale do you land? And if you aren’t in your zone of thriving, what could you possibly do today to help steer your life toward your own center space? You couldn’t have said it better Lisa! For me this has been a super hard balance to find. I have extreme feelings of guilt either way I go but then I also tend to be the “all or nothing” mom…all self-sacrifice or all self-care. How to find that balance?! I just had this conversation with a friend at church yesterday. I am having trouble with my 10 month old sleeping. My friend lovingly told me that I have to take care of myself in order to be any good to her and the rest of my family. I needed to train my baby to fall asleep on her own, even if it meant letting her cry (or scream) to do it. It is a very fine line that we walk. I was hard last night, but she ended up sleeping a 5 hour stretch which is long for her lately. Thanks for the kind reminder and a great post. Amen sister! What great insight. It seems I do struggle between self-neglect and then sort of fall apart and then get into the self-absorption mode only to feel guilty ( and I should…I AM being selfish when I do this). There is a better balance and self-care and sacrifice (hand in hand) is a great way to put this. Thanks as always for the encouragement. Many Blessings! You are so welcome, Becky!! So glad you took the moment to comment! You said it girlfriend! “It’s a farce that self-sacrifice and self-care are pitted against one another.” Even if cognitively I know I will be a better parent/mother if I am able to care for myself, there is a nagging little voice in me that says it’s bad! It’s a work in progress I guess! It super duper helps though that someone put it in the beautiful way that you do. At least I have something to remind me that “When self care is non- negotiable, restorative and prioritized in a mom’s life, she has the very best of herself to offer her family. And as she offers her very best to her family, herself and the world…she models to her children how part of living with your well being intact is caring for yourself as you care for others.” THANK YOU LISA! You said it girlfriend! “It’s a farce that self-sacrifice and self-care are pitted against one another.” Even if cognitively I know I will be a better parent/mother if I am able to care for myself, there is a nagging little voice in me that says it’s bad! It’s a work in progress I guess! It super duper helps though that someone put it in the beautiful way that you do. At least I have something to remind me that I offer the best of myself if I am able to take care of myself too. THANK YOU LISA!